Regency Hills at Providence is a 55+ community in Montgomery County, Pennsylvania. It offers active adult homebuyers luxurious yet, low-maintenance single-family homes. Regency Hills at Providence, a gated community in Collegeville, boasts a great location near recreation, entertainment, and culture. It's ideally situated in Upper Providence Township, close to daily necessities as well. Residents within Regency Hills at Providence enjoy a charming clubhouse. This private facility makes it easy to socialize among neighbors with club and meeting rooms. It s also complete with an exercise room, meaning expensive gym memberships are never needed. Active adults enjoy their vibrant lifestyles with the outdoor amenities as well. Whether swimming in the outdoor pool or jogging along the walking and biking trails, this 55+ neighborhood offers many ways to keep busy throughout the year. In addition, homeowners can utilize the 10,000 square-foot clubhouse and amenities within their sister 55+ community, Regency at Providence. This neighboring active adult community offers an amenity-filled clubhouse with a fitness center and indoor pool as well as a putting green, outdoor pool, and two tennis courts. Regency Hills at Providence was developed between 2012 and 2015 and consists of 108 single-family homes. Whether you are retired or a working active adult looking to downsize, you ll be sure to find a new home that meets your unique needs. There are seven models from which to choose. Ranging in size from 1,781 to 2,315 square feet, these detached residences include two to four bedrooms, two or two-and-a-half bathrooms, and an attached two-car garage. Ideal features include first-floor master suites, private outdoor areas for entertaining, and open floor plans. Snow removal, trash removal, and lawn care are all provided services within Regency Hills at Providence. These maintenance-free homes within Regency Hills at Providence allow residents to enjoy any lifestyle they please. Whether socially minded or fitness focused, homeowners can choose to be as busy as they want inside the clubhouse or with community events. 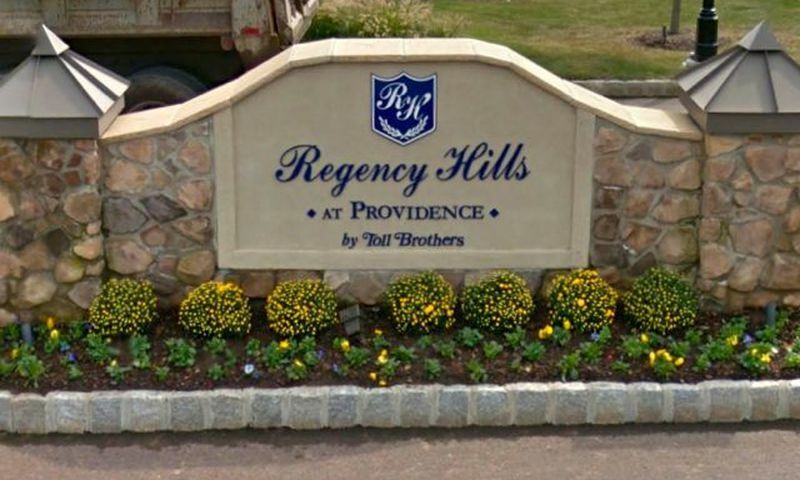 Regency Hills at Providence is located in Collegeville, Pennsylvania. Residents enjoy living in a picturesque community within Montgomery County. When traveling is on your agenda, the Philadelphia International Airport is less than an hour away, King of Prussia is a 15-minute drive, and Philadelphia is just a 35-minute drive. Regency Hills at Providence is also ideally situated near Route 422 and the Pennsylvania Turnpike. Closer to home, active adults enjoy many options for recreation and shopping. Valley Forge National Historic Park and the Audubon Wildlife Center offers miles of trails close by. Golfers will be glad to know that they are close to many private golf clubs like RiverCrest Golf Club, Phoenixville Country Club, and Chester Valley Golf Club. Shopping is easy and just four minutes away at Providence Town Center. Even more shopping at the Audubon Village and Collegeville Shopping Centers and The Market Place at Oaks is just a ten-minute drive. Regency Hills at Providence is a wonderful 55+ community located in a convenient location within Upper Providence Township, Pennsylvania. Check back soon for more information on the lifestyle in Regency Hills at Providence. Developed specifically for active adult homebuyers, Regency Hills at Providence offers new construction single-family homes. There are seven models that range in size from 1,781 to 2,315 square feet. Each home includes a first-floor master suite and offers two to four bedrooms, two or two-and-a-half bathrooms, and an attached two-car garage. 55places.com is not affiliated with the developer(s) or homeowners association of Regency Hills at Providence. The information you submit is distributed to a 55places.com Partner Agent, who is a licensed real estate agent. The information regarding Regency Hills at Providence has not been verified or approved by the developer or homeowners association. Please verify all information prior to purchasing. 55places.com is not responsible for any errors regarding the information displayed on this website.